Jaina Proudmoore summons a water elemental as Azmodan’s demonic army prepares to assault nearby towers. Kael’thas calls upon the Phoenix God Al’ar and sends Illidan and Kerrigan flying into the air, and Sgt. Hammer sets her siege tank sights on a dazed Diablo. Elsewhere on the battlefield, an annoying-but-adorable baby murloc named Murky is splashing around, wasting the enemy’s time and resources. This isn’t some outlandish Blizzard fan fiction; it’s a typical game of Heroes of the Storm, an incredibly accessible MOBA (Multiplayer Online Battle Arena) that taps into the heart and soul of Blizzard’s established franchises and brings them together for fast-paced and fun matches. 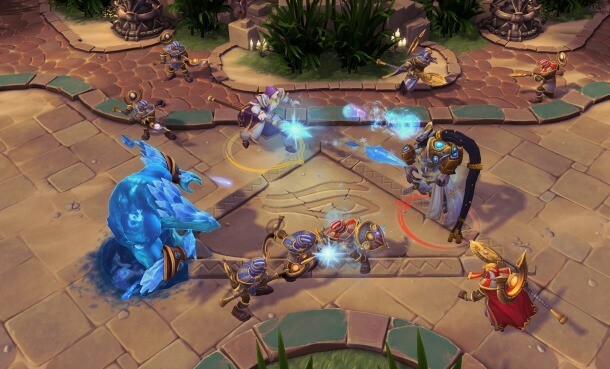 Heroes of the Storm puts you on a five-person team with the end goal of destroying the opposing team’s base, complete with lanes of auto-spawning fodder that march toward the enemy base with unwavering devotion. Like other MOBAs, the highlights of each match are the team vs. team interactions, with big ability combos, exciting chases, and daring raids into enemy territory. While Heroes of the Storm may appear to be similar to other genre offerings, significant differences make it more fun and easier to delve into. It is not as mechanically demanding as other MOBAs, and this works for it in a big way, especially for new players. In stark contrast to other games in the genre, there are no items to memorize or purchase during the game, and no last-hitting (scoring the last hit on a monster to acquire the experience and/or gold) lane minions. Team experience is shared so that no single player can be locked out of the game through continued harassment, and there’s no farming component that leads to games dragging on and on as teams prepare their “carry” (a character usually weak in the early game that scales well with items and abilities) for the endgame. The action is constant from the first moments to the last. Heroes of the Storm is completely team-oriented – even if you’re a rock star, you won’t be able to have a huge impact on matches by yourself. This isn’t a bad thing, but it can dull the “Whoa, look how awesome I did last game” factor, as things are absolutely more of a combined effort. Heroes of the Storm offers a wide variety of battlegrounds, and in many of the modes you won’t know which one you’re playing on until your game starts (though more competitive modes let you know beforehand so you can prepare a suitable team). These maps all have their own special flavors and themes, but they all have players working together to complete objectives like collecting special resources or capture points. These objectives provide the motivation to get battles involving many players happening early and often, providing hefty advantages to the team that can edge out the other. This balance works immaculately for driving the action – especially in public games where there may not be any communication; since the goals in any given map are known, players can instantly size up the situation and determine what they need to be doing. While it’s important to know where things spawn and how the maps work, loading screens provide essential bullet points, so you’re never going in blind. After a few games, you understand that you need to be fully healed and ready to explore the mines when it comes time to go building your Grave Golem. This understanding of maps, objectives, positioning, and timing expands as you move into more competitive modes, where you start selecting your hero and abilities to suit the objective-oriented engagements. The attention paid to bringing characters from the Blizzard universe to life in Heroes of the Storm is wonderful. The voice and ability selections are perfect; despite being pulled from different franchises and genres, the cast feels right at home inside Heroes of the Storm. Iconic characters have been distilled down to signature abilities that call back to their appearances in other titles. Sgt. Hammer is a great example of this – even far away from the confines of StarCraft, you feel like you’re playing an actual siege tank, complete with siege mode. Blizzard perfectly captures the essence of its heroes, from Nova slinking in the shadows planning a perfect ghost snipe to Uther bringing down the light on your foes while healing your allies. While many characters fit clearly defined roles in team composition like tanky initiators, fragile damage dealers, or supports, Blizzard isn’t shying away from playing with wild concepts and cool ideas that break the mold. The Zerg evolution master Abathur, The Lost Vikings, and Murky offer more advanced gameplay styles. Abathur can dictate the flow of battle from afar like a real-time strategy commander; in fact, many new players simply assume the Abathur is sitting AFK in the base. The Lost Vikings are three characters in one, leading to some interesting opportunities on maps that require you to toss a character into the Dragon Knight or Garden Terror, or “soak” experience across multiple lanes while your entire team pushes hard into a single location. Murky is a frail baby murloc who dies easily and often, but he can immediately respawn and continue annoying your opponents while your “real” teammates either do work across the map or take advantage of the enemies wasting their abilities on your mrrglrlrlrmgrrrl meanderings. These diversions from standard archetypes add a great deal of fun while still feeling balanced. Heroes of the Storm succeeds like so many other Blizzard titles by taking what makes a genre great and distilling things down to the fun, and it does so with plenty of charm and character. With quick and action-packed games, Heroes of the Storm is accessible to new players, but with enough depth that to ensure that you are still learning new ways to use your abilities in different situations and battlegrounds after hundreds of games. 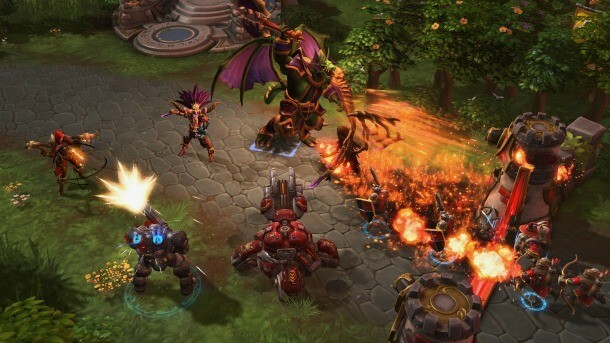 As with many games in the genre, Heroes of the Storm is best experienced with friends.